News from Archivists Round Table of Metropolitan New York, Inc.
DDAT offers educational events for its members at least twice per year. Past training programs have included: emergency salvage training, fire safety and preparedness, Community Emergency Response Team (CERT) training. DDAT was also the cosponsor of the Connecting to Collections training series held across Delaware from 2010-2012. For more information on DDAT, please visit our newly redesigned website. DDAT’s fall program will be an emergency response and recovery vendor and resource expo. It is being held at the Biggs Museum of American Art　on　October 24. Vendors will be on-hand to meet with attendees and discuss their available products and services. Planned attendees include: Polygon, Mid-Atlantic Regional Archives Conference (MARAC), Gaylord, Susan Duhl (independent conservator, consultant, and trained emergency responder), and Delaware Division of Libraries among others. This is a members-only event. Attendance is open to up to 4 individuals from any DDAT member institution. If your institution is not currently a member, please consider joining. Membership is just $50 per year and includes the aforementioned participation of up to 4 staff members at training sessions, workshops, and other DDAT programs. For more information or to join, please visit the membership page of our website. Have You Ever Wanted To Be More Involved With MARAC & Make A Difference In The Process? If you are interested in carrying the leadership banner for your home locale as part of the Steering Committee, please consider running for Caucus Chair as a representative of the District of Columbia, Delaware, Maryland, New Jersey, New York, Pennsylvania, Virginia, or West Virginia. Further Information about offices, committees, and governance is available on the MARAC homepage at – http://www.marac.info/. If you have additional questions, more details can also be happily furnished upon request. Please contact a member of the Nominations and Elections Committee if you are interested in running, or know someone who you think would be an ideal candidate for any one of these open positions. Thank you in advance for your consideration and we look forward to hearing from you! SEPTA, the Southeastern Pennsylvania Transportation Authority, oversees most public transit in Philadelphia (NJTransit and PATCO provide additional service between Philly and New Jersey). We locals like to complain about SEPTA, but most of the time it can get you where you want to go. Still, there are a couple of things I like to warn new SEPTA travelers about in advance. We still use tokens. I think we’re the only big city that still does. Unless you’re planning on making a lot of trips in one day, or staying more than 4 days, don’t buy a pass–single tokens are your best bet. Tokens cost $1.80. Cash fare on subways, buses, and trolleys is $2.25. Exact change only! In most stations, tokens and other fare instruments are cash only. Some stations have machines where you can buy tokens, but these are also cash only. You can buy tokens at the subway stop at 2nd and Market, at 30th St/Amtrak Station, or at any of these Center City sales locations http://www.septa.org/sales/locations/ccp.html (ZIP code 19106 is closest to the hotel). Within Center City, subways and buses are your best bet. Subway/El: The Market-Frankford Line (Blue Line) runs east-west through Center City and West Philadelphia along Market St. The 2nd St Station on the Blue Line is closest to the conference. Trains run every 6 minutes until 6 PM, every 8 minutes until 8 PM, and every 10-15 minutes until midnight. After midnight, the subway stations close, but a Nite Owl bus bus follows the same route, arriving every 15 minutes. Yes, transit runs all night! The Blue line connects to the north-south Broad St Line (Orange Line) at 15th and Market. Buses: Walk to the northeast corner of 2nd St and Walnut St (5 minutes from the hotel) to catch the 9, 12, 21, or 42 bus, all of which travel westbound on Walnut through Center City, diverging around 22nd St. To return to the hotel, catch the 9, 21 or 42 on Chestnut St or the 12 on Locust St. If you want to plan a trip on SEPTA, the easiest way is to choose the Public Transit option on Google Maps. Wondering about transit to a particular destination in Philadelphia? Leave a comment with the address and we’ll try to help you out. Philadelphia has long embraced public art, becoming the first city in the United States to establish a Percent for Art Program in 1959. 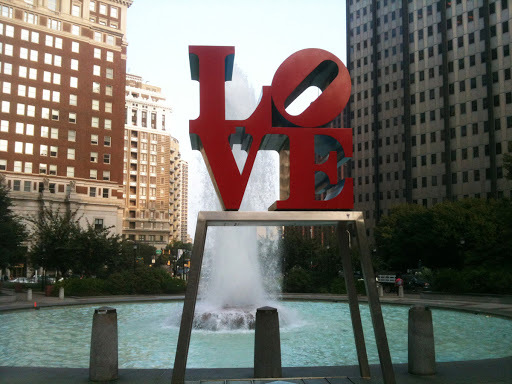 Many visitors are familiar with Robert Indiana’s iconic “Love” sculpture (above) but, with one of the nation’s largest collections of public art, there is so much more to see! A great way to find and learn about Philly’s public art is through the Association for Public Art’s interactive map. For an audio tour of many of the city’s sculptures, check out the program created by Museum Without Walls. This interactive map of audio downloads and audio slide shows (a photo slide show with narration) includes 35 stops of 51 sculptures along the Benjamin Franklin Parkway and Kelly Drive. Coming from all walks of life, each narrator is connected to a sculpture by knowledge, experience or affiliation. There are several ways to access the audio: view the audio slide show on your smartphone, download the app, download the audio to a personal device, or call the audio tour phone number from the street. Murals are another striking form of art that you’ll see around the city. Begun in 1984 as part of a wide anti-graffiti initiative, the Mural Arts Program has now produced over 3,600 murals. In addition to city beautification and community empowerment, education programs serving at-risk youth and rehabilitation centers are also a central component of the Mural Arts Program. Paid guided tours are offered, but you can also venture out on a self-guided walking tour of the Mural Mile, a selection of seventeen murals in Center City. Download a map and use your cell phone for an audio description of the Mural Mile artworks. 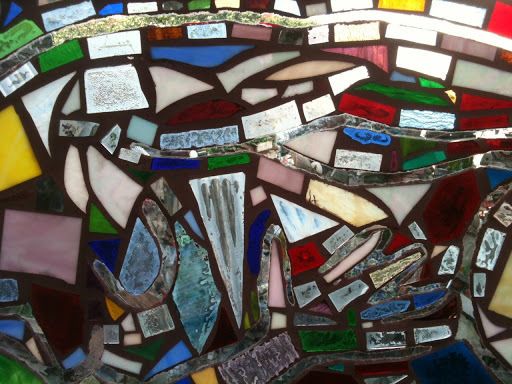 Isaiah Zagar’s colorful mosaics of tile, glass, mirrors, and found objects decorate walls throughout Philadelphia. 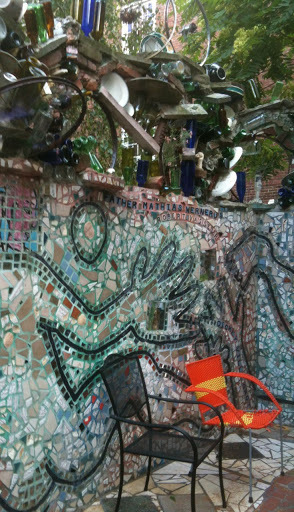 This local artist’s largest artwork is located at Philadelphia’s Magic Gardens, which includes a tiled indoor space as well as an outdoor mosaic sculpture garden that spans half a block on South Street. Although there is an admission fee to enter the sculpture garden, it is partially visible for free from the sidewalk. 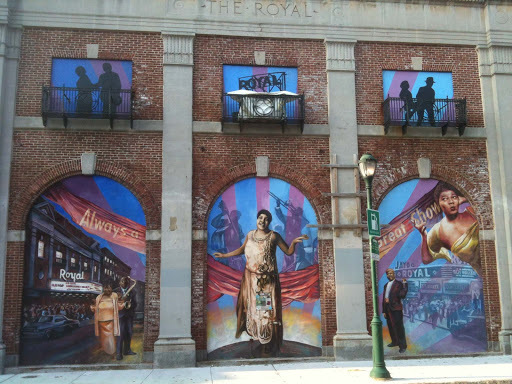 As you explore the city, keep your eyes peeled for Philly’s captivating public art! The Mid-Atlantic Regional Archives Conference invites submissions of session proposals for its spring meeting to be held April 24-26, 2014, in Rochester, New York. Deadline for proposals is October 31, 2013. While the conference theme is “Film, Freedom, and Feminism,” the Spring 2014 Program Committee invites proposals on all aspects of archives and archival work. Creative and timely presentations from professionals in archives and related fields (public history, libraries, museums, genealogy, information science, and records management) and from graduate students are very welcome. Of the many culinary delights that Philadelphia is known for, including pretzels, hoagies, Scrapple, and pork rolls, perhaps the best known is the cheesesteak. There are literally dozens of places to buy this famous delectable, and five will be described here. If you attend MARAC from Thursday through Saturday, you should be able to get to all five, consuming one for each lunch and dinner. Campos (214 Market St) is one of the closest to the hotel (0.5 miles) and also just down the street from Independence Mall. Like most places, it serves cheesesteaks with or without grilled onions, and three choices of cheese: American, Provolone, or Wiz. That last one is short for cheese wiz and some locals swear that is required to make an authentic cheesesteak, but my taste buds have found provolone to be superior. You may have heard of Tony Luke’s, which has many locations in the greater Delaware Valley and also sells frozen versions of its fare in supermarkets, but the original store (39 East Oregon Ave, 2.3 miles) is a stroll down the waterfront. Another place in the area is John’s (14 E. Snyder Ave, 2.7 miles away) which in addition to serving “the ultimate cheesesteak” is also, “Since 1930 Home of the Original Roast Pork Sandwich,” another Philly taste bud pleaser. Note that this is a breakfast and lunch place that closes at 3 p.m. Finally, in the Ali vs. Frazier department (Philly is also famous for its boxers, real and fictional), there is Pat’s (1237 E Passyunk Ave) and Geno’s (1219 S 9th St.). 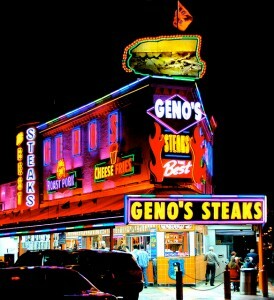 Each is located about 1.5 mile walk from the hotel and just a block apart; the two have been duking it out for decades. Pat’s website offers useful tips on how to order like a local. Which is the best? Go with a friend and buy one from each and share, then you decide. Note: Most of these places do not accept credit cards.